Successfully Added Giant Keyboard Shift Key LED Desk Lamp - Ultimate Geek Gift to your Shopping Cart. A desk lamp in the shape of a giant keyboard shift key! Exceptionally practical and outstandingly cool, it's the perfect gift for that special geek in your life. What does it do? It's an LED desk lamp in the shape of a giant shift key. Aside from illuminating the cluttered universe which is your desk it also serves as a beacon of sanity...whenever you're stuck trying to complete a TPS report, just "shift" your mental processes and think about what you'll do after work. Namely watch the 2nd season of Star Trek The Next Generation again for the 12th time. How does it work? Plug one end of the USB cable into your PC and the other end into the Giant Keyboard Shift Key. Now simply press down on the key. LET THERE BE LIGHT! 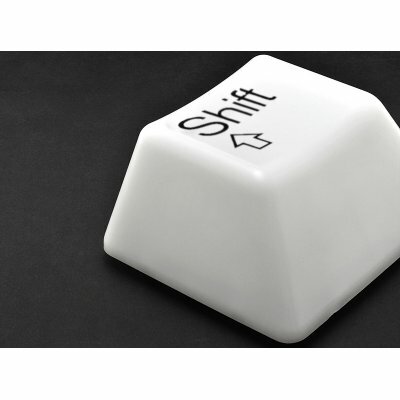 This Giant Keyboard Shift Key has one of those springy bases which serve as an on / off button for maximum convenience. All power requirements are gotten from your PC or laptop or notebook or netbook's USB port. What's more, you can power this device as a standalone lamp using three AAA batteries. Neat huh? Who is it for? Despite being really hot and once being the prom queen at your high school, you have a secret crush on Kumar, the geek in IT. In fact, you've always been attracted to intelligent guys. So instead of getting Kumar something he won't use like cologne, get him a gift that will show him you speak geek. He'll fall in love with you in 0111001 seconds! (That's binary btw). Also perfect for dweebs and nerds, the Giant Keyboard Shift Key is the perfect way to befriend interwebz roaming keyboard cowboys. Brought to you by the all your base belong to us geeks at Chinavasion. Order your cool keyboard shift key desk lamp now at our special introductory 10 MOQ (minimum order quantity) now. After 60 days, the MOQ will increase to 20 pieces.